This little charge of mine is getting ready for Christmas. His preparation begins on December 26th, after he's sized up his loot. Like most little six year old boys, he's excessively wild for toys. He studies toy catalogues like they were newly discovered texts of ancient scripture. They are sacred and holy to him. We only buy toys for Christmas and birthdays, so there's a lot of space in between for dreaming about toys!toys!toys! But what if he had his own money to spend? What kind of toy buying spree would follow? He has it! 1000 bucks, figuratively in the pocket of his gymboree jeans. 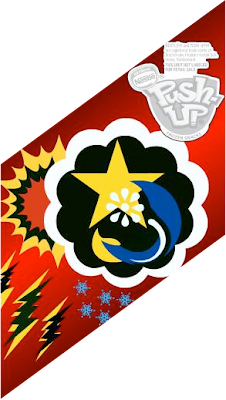 West won the Scholastic Push Up and Create contest a few weeks ago. 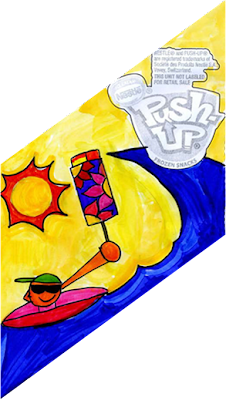 Here's the wrapper he designed for a Nestle push up popsicle. Isn't it cute, in a very six-year little-boy old sort of way? The contest allowed entries from kids ages six to twelve. The other kids are accomplished artists, but my little boy had big dreaming on his side. Here's his winning entry. 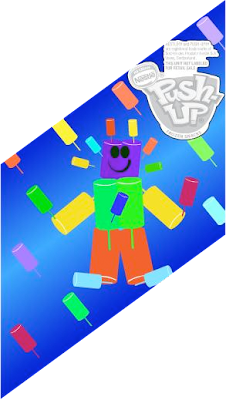 In addition to winning $1000 dollars-and don't worry, the lion's share is going straight to his college fund- he also gets to donate $2500 to a local public school, and have his winning wrapper features on Push-Up popsicles next year. Here are the other winning entries. Here's my question for you wise and wonderful readers. West wants to buy himself a DS. I want to hear from you readers that have kids with DSes in the home. Would we be sliding down a slippery slope with no possibility of return? Will West be hiding in the bathroom all day, playing his DS? Will he forget about his desire to kick balls and throw rocks outside, preferring instead to become a video game head? Chime in and advise, oh wise and wonderful readers. For the moment, I've got a happy little fella on my hands. It's good to remember that dreams really can come true. Even when you are six. I love his wrapper! I love that he got the contest bug from his mama too. I am buying push up pops all summer until I get that wrapper. Congrats! As for the DS...be careful. I asked toy advice and it turned into a bloodbath. I learned that people have STRONG opinions. I personally don't like video games for so many reasons and I will put off getting any kind of video game console for as long as I can hold out. That said, you are not the kind of mom who will let West go in his room and play violent games until his eyes pop out and he becomes a zombie. Just like the internet, there is some fun and entertainment in video games but both have to be monitored. Congrats to your little guy, very cute wrapper! I had the same dilemma with the wii. My son loved it for awhile and then lost interest which I was glad of. . It just depends on what kind of personality your child has I think. I have been a gamer and videogamer most of my life. It was something my brother and I did together while I was growing up and my husband and I do now, with our kids (4 and 2). We have 2 DSs, but they're both 'mine.' The kids have to ask permission to play with them, have to follow rules about being careful with them. We play them together, as a family, and in moderation. They work a lot on counting, fine motor control, color recognition, all sorts of things, but I'm always involved while they're playing. We just got my ^ yo a DS and it's a lifesaver: she can play it on plane trips, long car trips and driving to and from school. Otherwise we don't have time for it. She started off wanting to play it all the time but is now very satisfied with using it in the same places where I would be reading a book. My 3 yo now has a Leapfrog for the same times and it's all good. And congratulations-what a great design. I prefer a full size game system like a Wii to a handheld...it offers more interaction with others and can be fun for the whole family! And then just set limits. We only allow video games on the weekend here. Perhaps true. But we fly intercontinental economy and they won't let us use a Wii onboard. Also, for interaction, I like board games. Congratulations to your little guy! As for the DS, my daughters both got one for their birthdays last year and we haven't had a problem. They have very few games as most were also birthday and christmas gifts with a few hand me downs from their cousins. I think that has made a difference. Not buying them every game they want makes them appreciate the ones they have. Luckily they would both rather be drawing or reading anyway. It is handy to bring on long trips or if we're going somewhere that they have to sit and wait. And if it becomes a problem you could always just put it away for awhile. So neat. Congrats to him. I say let him get the DS, you can moderate the activity level. My little guy loves video games, it comes and goes, just like anything else they do. Congrats to Westy boy! And what a quandry. I don't know what to tell you but maybe in 2 to 4 years from now when one of my charges asks for a DS, you'll have some good advice for me. My son got his first Nintendo at age 8; we had all these rules about how often he could play on it, where he could take it, what had to be done before he could use it everyday, etc. He got it and played it as fully as the law would allow, and after two weeks, it was no longer "the most coveted toy" to play with. He forgets about it for weeks at a time, so enforcement is not really a problem. It IS handy, however, to be able to say "If you don't (whatever), I'm putting your game system away for a week, mister." It only took the first time...Worth it? Meh, sure. It wasn't the Pandora's Box I worried it would be. My son has a DS and we've had no problems whats so ever..we dont allow problems to happen to begin with. Also his fine motor skills are better, his math skills are crazy good and honestly he just enjoys thats stuff so why not? Love the wrapper. Congrats West. Good going. I seriously doubt he'll turn in to some mind-numbed robot. I am a recovering game addict and I'll tell you that the only reason that happens is because there's some kind of basic unfulfilled need: socially, emotionally, spiritually. He's well enough educated to find pleasure in many different interests. Plus, as someone else said, it's what he likes, so be understanding. My mom always tied video games directly to music practicing. So my brother ended up doing at least 2 hours of violin a day. Now he's a concert violinist and has great friendships that happen to involve gaming. Not a bad way to go. My sister-in-law has two boys with DS's, ages 9 and 6. They are HUGE fishermen and hunters and outdoors boys. they just get a certain amount of time on the DS at a time. Then they get turned off and the boys are whisked outside. It works for them. Congrats!!! Your family is so talented! Congrats to him! I can only imagine how excited he is and how proud you are of him. PS. I've got a little something for you on my site to thank you for letting me read your awesome blog! We have a PS3 and I love it! My son does as well. He can only play on the weekends, and only if he does well on his weekly tests. It also serves as a good threat - threaten to take away the video games and he starts to walk a pretty straight line. As with TV, kids will only watch so much of it until the urge to run is too great. He will voluntarily turn off the games and ask to go play in the backyard with his little sis. Congrats to your son. I love his design. He must be so excited. Imagine being able to go into the grocery store and see his label on the shelf. Hey E- We got Nate a PSP(similar to a DS) for his birthday. We just set limits on its usage, he has to ask first and usually has to do an extra set of piano playing or a second interval of reading or math. That being said we are very pro video game ourselves, if you remember correctly I grew up playing atari and gaming on my apple IIe, it did not rot my brain and I think I have excellent hand eye coordination. It really depends on your childs personality as well, is he obsessive compulsive? If so no gaming. Congrats! on the contest, you must be very proud. I remember our atari obsessions. Space invaders had me really hooked for a while...and then it passed. West is a bit like me; he can get hooked on a mania, but it never lasts too long. I've spent many nights without sleep over tetris, boppit, crossword puzzles, the rubic's cube, mind sweep and the like. But once I conquer, I clear out. I like the idea of making him pay for his time with extra piano etc. I'm really looking forward to your family's Christmas card this year. They are always soooo cute. Congratulations to We on the contest. You and hubby are such good parents. I have told my children- "Dont't buy video games for the grandchildren". Be careful and consider the decision very very carefully. I just bought 2 ds's for my boys (ages 9 & 6) for Christmas. I guess that tells you my take on it. Fear not! He will initially be obsessed but it will soon die off. My 9 year old has one and I cannot even remember the last time he used it. I am more likely to find him outside playing or curled up reading a book. They are fantastic for LONG car rides, hotel rooms and over night flights! Wow- very impressive! And a nice little sum! I have a five year old, almost six. DS was on his Christmas list, his sister (14) had one. He got the DS and played it more when he used his sisters. I have homeschooled 5 children and find they have a great deal of fun being creative when I am not legalistic.